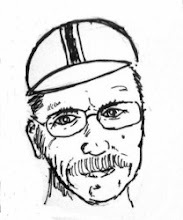 Shortly after I published my article What Long Distance Cyclists Really Eat, my pal Joe "That's Rando!" Platzner revealed something that he believes may be the ultimate randonneuring fuel: Trader Joe's Sesame Crepes. Today I finally got around to trying this amazing food and I can report that all of Joe's wonderful words of praise were right on the mark. At 99 cents, a package of two crepes is about the tastiest 1000 calories I've ever had. The crepes are chewy and not too sweet. The packaging is a bit big to fit in a jersey pocket (each crepe is about 7 inches in diameter, but you can roll the crepes up like tortillas or tear them into bite-sized bits before your ride. But having a pack of these things stashed in your handlebar bag could be just the thing to get you over that last mountain pass on a six-hundred kilometer ride. The ingredient list is refreshingly brief. Certainly not a health food, but at least I can pronounce every ingredient. While I'm not a nutritional role model, I am trying to do my bit for the orangutans by avoiding products containing palm oil. I'd been looking for something to replace the palm oil rich Pay Day Bars in my diet and Trader Joe's Sesame Crepes fill that niche quite well. P.S. No, I don't have any sponsorship from Trader Joe's, I just like their stuff. I got all the details on this from my pals at the Village Bicycle Project. Alas, I'll be working in Issaquah this Saturday, but if you've got some time this weekend, you can put it to great use and have a fun time doing it by helping Meg and the others at VBP. Details below. The Village Bicycle Project will be loading a container of bikes for Ghana, Saturday April 24, in Georgetown, at Total Reclaim (1915 South Corgiat Drive), starting at 9 AM. As always, there will be good wholesome hard work, and lots of fun. Packing them tight and closing the big double doors is always cause for celebration! Munchies will be provided. Bring a water bottle, closed toe shoes and bike tools if you have them. DIRECTIONS to the April 24 loading: By bike from Beacon Hill, go south on 15th Street and cross the freeway at Albro Pl. then take the first left. You’ll be on Corgiat, go about half-mile, the road curves sharply to the right, then you’ll see the warehouse, 1915 on the left. If you keep going you’ll be on the railroad tracks. Driving from downtown Seattle, take I-5 south about four miles to Albro Pl. Swift Dr. exit 161. Go straight at the off-ramp traffic light, you’ll be on Corgiat, go about half-mile, the road curves sharply to the right, then you’ll see the warehouse 1915 on the left. Keep going and you’ll be on the railroad tracks. From Tacoma on I-5 take Albro Pl. Swift Dr. exit 161, turn left, cross over the freeway then take the first left you’ll be on Corgiat, go about half-mile, the road curves sharply to the right, then you’ll see the warehouse 1915 on the left. John Burke visited the Bicycle Center today. John Burke is the president of Trek, the largest bicycle company in the United States. The Bicycle Center is a small shop (our entire staff is 4 people!) in a small town (Issaquah, Washington). John introduced himself this way, "Hi, I'm John. I work at Trek." "Hi," I replied, "I'm Kent. I work here." John is a good, down to earth guy. John succeeds in business by making a good product and selling that product through a network of good dealers. And if you want to know how to succeed in the bike business, it's probably worth about twenty-four minutes of your time to watch the video below. It's from a couple of years ago but the message is a good one. Cyclists of a certain mathematical persuasion obsess about bicycle gearing. Entire books have been written on the subject and the great Sheldon Brown has a wonderful page on the subject here. While Sheldon made the case for his mathematically pure gain ratios and I think people in metric-thinking countries have adopted development meters, American cycling nerds (myself included) still measure things in inches and miles. Just the other day a friend asked if I was mentally mapping the upcoming Tour Divide in miles or kilometers. Without a second's thought I replied the same way I'd imagine Yogi Berra would, "Miles, of course. It's way too far in kilometers." Single speeders and fixed gear riders to a single gear combination. On my Monocog Flight, that gear of choice is calculated by taking the chainring (32 teeth) divided by the rear cog (18 teeth) and multiplying by the wheel size (29 inches) to get 51.6 gear inches. But experienced single speeders know there is another gear, the low gear you drop to when you need to. Some folks say "I've got two speeds: riding and walking." Others use the mathematical expression "dropping to the 24-inch gear." Twenty-four inches equals two feet. Sometimes, we get by with our own two feet. Today I had plans to train, plans to ride the high passes and log a lot of miles in the saddle. Today I had plans, but the day had other plans. I made it to Rattlesnake Lake, a pretty bit of water under a pretty mountain that's an easy 25 miles from my home in Issaquah. The sun was shining on the bare ridge of rock 1175 feet above the lake and while I could ride up to passes I'd ridden before, I'd never been to the top of that ridge. It's not a biking trail, it's a hiking trail, so I parked the bike and dropped to the 24-inch gear. The way to the summit is not a straight path. It winds and turns back on itself. It is impossible and unwise to only focus on the peak and the trail reminds me of this. I climb through a green world, one step at a time. While the view from the summit is, of course, spectacular, it is the walking I remember. The green of the moss on the rocks and trees, my breath on the climb, the care that must be taken with every step. Heading down, back to the lake and my bike, I meet up with this small fellow. He's not here to train, to stare down from a lofty height or take pictures for his blog. He's only here to live. This is his home. On other days the maps and the clock and the race will tell me where I have to be. Today, I think I needed to be reminded of why I ride in quiet places. Today, the path drew me off the bicycle for a bit, to remind me of the things that move more slowly, at the pace of a 24-inch gear. Long-time readers of this blog know that I manage to fund my adventures with a lot of help from my friends. Even a frugal guy like me who races the Divide on something less than a shoe-string budget manages to burn through a fair chunk of cash on an adventure like this. At a small town mini-mart in Wyoming, they don't take a blog post in exchange for a heat-lamp burrito but they do take cash. It's not a lot of cash per burrito, but it takes a lot of burritos to make it to Mexico. So, again, thanks to all my grass roots supporters. You people make these adventures possible. And thanks again to my wife Christine and the people at Bicycle Center for putting up with all my time on the trails, to Dirt Rag for deciding to print and pay for some of the words I write and to SBS for a bike that proves it's toughness every day on every trail. While this thank-you list is getting close to becoming as long as the Great Divide Mountain Bike Route and I have to add one more sponsor to my list: Adrenaline Promotions. A couple of weeks ago, John Ambrose of Adrenaline Promotions called me up.He'd heard about the Tour Divide, heard about me and he had a proposal. 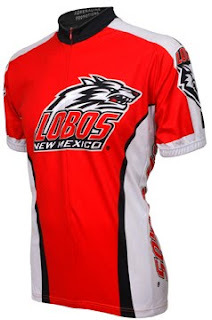 John explained that his company is quite small and they produce licensed collegiate jerseys. If I'd be willing to wear Adrenaline jerseys in the Tour, Adrenaline would provide me with the jerseys and a small cash contribution. Small by John's definition is big in terms of the number of burritos it will buy, but I only accept sponsorship from firms that make things I actually would use, like and trust. I told John that I'd go to his website, check things out and think things over. John's plan was a good one. Adrenaline makes jerseys for Montana, Wyoming, Colorado and New Mexico. 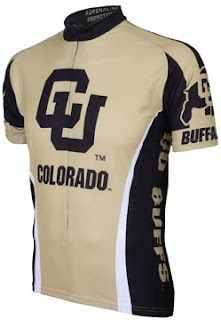 I'd wear the jersey of whatever state I was riding through. Depending on conditions I may be layering the jerseys with warmer layers and for part of the ride I'll be sporting the Turtle Jersey given to me by my friend Dave Nice and the great people at Over The Edge Sports. The jerseys looked good at the website and they are even better looking in person. Yes, I took John up on his kind offer. 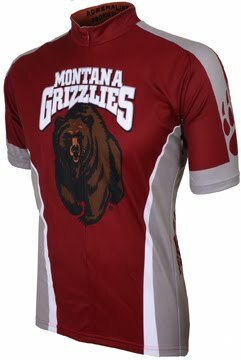 It was the Montana Grizzlies jersey that really sold me, I think that one is just stunning. All the jerseys are very nicely constructed with long 3/4 length zippers for cooling. I like things that pack small and I was happy to see that the jerseys can stuff down to a very light package about the size of a softball. The jerseys I'm not wearing will pack into a stuff sack to form my bivy pillow at night. In racing, as in life, we are all just passing through, but we connect, however briefly, with where we are right now. 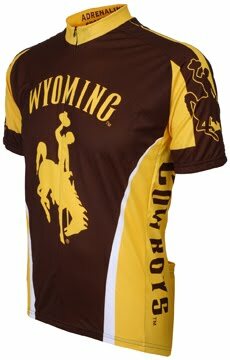 I'm not a cowboy but each time I ride through Wyoming, I learn a bit more about the cowboy life. We both put in long days in the saddle. In two months I'll be at the starting line in Banff, Alberta. There are at least a thousand things I have to figure out between now and then but I'll solve those problems and roll down that trail. Thanks to all my supporters, including Adrenaline Promotions, at least I know I'll have something to wear and I won't starve. Capitol Forest is a lovely 150 square-mile chunk of mountains, trees and streams a bit over a hundred miles (as the Turtle rides) from my home in Issaquah. Since the forest includes over 500 miles of gravel roads and more than 150 miles of single track, it's just about the perfect place for me to practice for the Tour Divide. My practice consists of going slowly, testing what I have to see if it is enough. I have too little gear to be taken for a bike tourist and I'm going far too slowly to be mistaken for a bike racer. I fuel at bakeries, cafe's and mini-marts. When asked where I'm coming from, I fall into the randonneur's white lie -- telling folks the last town I passed through rather than the place I left this morning. Too much distance is too much to explain. My eyes see more than my camera, but an eagle on a branch or a coyote running in the low scrub make me try to lock these wild creatures down in pixels. And I'm still a sucker for small town pride, history packaged in parks and odd bits of roadside Americana. I sleep in a green place and listen to rain falling on the trees and tarp. Morning brings every kind of weather and I climb into fog and hail and more snow than I thought I'd find here in April. At the fork in the trail, one route goes higher. I think it goes over the mountain but water has seeped onto my ink-jet map and the way up is indistinct. I add a better map case to my list of items to procure back when I'm in the world of men. I take the downward fork and roll toward the lower country, where the sun is shining and machines are busy making coffee. The Tour Divide follows the Adventure Cycling Association's Great Divide Mountain Bike Route from Banff, Alberta to Antelope Wells, New Mexico. Years of work went into researching and mapping the route and the Adventure Cycling Maps are essential guides to the trail. The Association works to constantly keep these maps up to date, publishing revised maps as needed and providing addenda of info that has changed since the last map printing. My vintage 2005 maps from the last time I raced the Divide by now had dozens of addenda items, so I splurged and got myself the most recent set of maps. In theory, someone could navigate the entire route entirely by GPS and the Adventure Cycling folks have all the GPX files available for download on their site, but the paper maps are packed with much more handy info than can be captured in mere coordinates. The double-sided Adventure Cycling maps are corridor maps, they focus on the route. While they provide a wealth of information about the route, terrain and services on or close to the trail, with the exception of a small (4" x 4") index map the maps don't show much of the world beyond the route. If you are planning on venturing off route, you'll need general maps. The maps are very well designed to keep you on route and every square inch of them is packed with useful data. Even the smallest towns along the route are listed, along with the services you'll find there. Campgrounds are listed as are motels, bike shops, libraries, grocery stores and service stations. The maps also include a bit of history and weather data. Also included are the handy and sometimes depressing elevation profiles. Turn by turn directions are designed to keep you on course, with mile and kilometer designations and a bit of description. At times the description is cautionary ("start climbing a virtual wall") while other times it celebrates the terrain ("entering magnificent country offering long-range views"). In addition to the maps, my friend Dawn made sure that I have the latest edition of Michael McCoy's book Cycling the Great Divide. This book narrates the US portion of the trail as a sixty-two day trip. 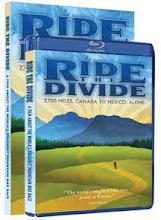 When I raced the Divide back in 2005, I used the first edition of this book for research. Of course, since I was racing, I compressed McCoy's schedule by a factor of three. I took the maps with me and left the book home with Christine. On my nightly call-ins I'd often ask her "what day am I in the book?" I'll do something similar this time, although I'm hoping with experience and bigger wheels to flip through those pages a bit faster this time. The maps are not the terrain, but they are the stuff of dreams and the details we need to make the proper turns on a twisty trail. I'm a proud member of the Adventure Cycling Association. There the folks that make these adventures possible.